Continued from the Central Michigan trip report…. It was an early wake up call on Friday for two reasons; a) check in on Southwest for Saturday’s flight home and b) the 135 mile drive from Mount Pleasant to Kalamazoo, which I again miscalculated by about 60 miles. As mentioned in the CMU trip report, Target had his own rental car so we were in a convoy. At least until Target decided to pass me, whereby I then hid behind a truck just to make things a bit more interesting. These are the things you do in the middle of nowhere on the way to slightly less than the middle of nowhere. I think the best that can be said of the drive was when Al uttered, “Your driving is not very exciting.” Umm, thank you? To which I proceeded to drive on the rumble strips. Rumble, rumble, rumble. The convoy arrived in Kalamazoo and we headed to the Stuart Avenue Inn, a bed and breakfast, booked by Target (more on that later) that would be our home for the night. Now, let’s get this out of the way. The location of the Stuart Avenue Inn is great; walking distance to Waldo Stadium, Kalamazoo College and Western Michigan University. The innkeepers, Dana and Chris, were very nice accommodating people who did everything in their power to make our stay with them and in Kalamazoo very enjoyable. The room was very nice, spacious, and very clean. The simple fact is, I am not a B&B kind of guy. With my wife, in the mountains, on a romantic getaway…maybe. But not on a football trip with two other guys. Just not my speed. But I will say, we have been in much worse places on CFQ. By far. So all in all, it was not bad and was enjoyable, it’s just not for me. I do wish to thank Dana and Chris who are very nice people and run a very nice inn. They went out of their way for us and made us feel very welcome. So if you are a B&B person, you will not go wrong here. We departed the Stuart Avenue Inn and headed for campus. But not without the obligatory stop at Starbucks for Al’s ridiculous Chai tea obsession. The guy does not even drink coffee but is obsessed with Starbucks. Now that is just brilliant marketing or insanity, I am not sure which. But I will say that I was so parched that I actually got a drink. I think it was a Macho Libre Grande Salted Caramel Mocha Frappuccino Blended Cafe Latte Dolce Creme Fraiche with a twist of Hazelnut Java Vanilla. Once I passed the credit check, it was mine. I will say that it was very good, or I was very thirsty. It was then onto campus. First stop was lunch at the truly awful Greek place in the lower level of the student union. Very nice employees, truly awful food. We will note that for our next time in Kalamazoo. After lunch, and a trip to the infirmary (just kidding), it was time for the donation to the local economy, aka shopping. Boy did WMU make it difficult for us to spend money. First the bookstore, then some off campus stores, then back to the bookstore, and the consensus was there was very little Bronco gear that we liked. After we all settled on something and not very happy about it, we went back to the Stuart Avenue Inn to drop off and change for the game. Al and his excellent twitter networking skills had us hooked up at the Brisket Fest tailgate. We made a pit stop at the package store (Beth can’t help but note that this is the correct name as this is what they call it in Massachusetts) for some libations, because you never want to show up at a tailgate empty handed. Al went with Hoegaarten, I went with Mike’s Hard Lemonade Mango (Beth is jealous), and Target went with some mixed bag of local beers that he could not carry since it did not come as a set. He would have been better off with Schlitz. We then proceeded to the Brisket Fest tailgate and our host Billy Martin. Bill is a local fan of the Broncos, who was posting feverishly on Twitter that if the Broncos could get off to a 3-0 start, they’d be in the National Title hunt. Clearly this led to conversation with Al. We had a very pleasant time here, spending a lot of time with Heidi and David Finkle, who kindly told us all the history of the school, sports events, team, etc, as well as introduced us to a few new beers and a motorcycle handle-barred blender. David convinced Target to try it and fortunately he didn’t cut off any fingers. Heidi sent over a few good pictures of us with her, David and Billy. Good times were had by all; no one left hungry or sober. Good stuff. One thing we learned during our visit here is that the hatred for Ohio State is universal. Al adds that “We also learned Michigan has the longest coastline of any state in the country”. Jarrett says that there is no way this is true and it must be the alcohol talking. Al further adds that Michigan would make for some good vacation/camping spots for Al in the future when the boys are older. Eventually it came time to go to the game. It can be a tad annoying when the game gets in the way of some good tailgating, but we are here for the game after all. Or are we? I don’t know at this point. We had guesses as to how much of the stadium would be occupied by Michigan State fans. 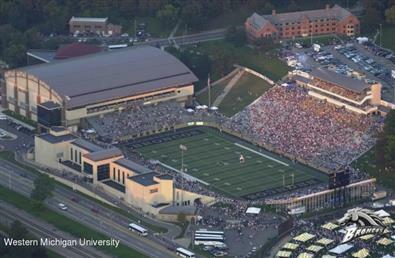 But kudos to the WMU staff for somehow managing to keep the home field advantage. Judging by the large gap in the corner of the student sections, WMU decided not to sell certain seats instead of selling them to Michigan State fans. You’ve got to respect that decision. Much to my amazement, the MSU green in the stands was a very small percentage. Our vantage point for this game could not have been any better. Due to the crushing amount of in state attention on this game, the press box was filled to capacity, so overflow press was down on the field. That worked as we do not love sitting in the press box anyway. So, we were able to take in the action from field level. Once again, thank you to the Athletic Department for accommodating us on what easily could have been the biggest home game in the history of the program. Thank you. As a side bar, we met and spoke briefly with the President of the University, who was on the field taking in not only the huge visiting guests they had (no not us), but also to thank the rich dude who donated a few million to buy a new scoreboard for the Broncos. And yes, the rich guy was old, and his wife was younger than his daughter from previous marriage. Just wanted to get that in there. The Broncos put up quite a good fight against the #5 ranked Spartans. The game opened with WMU returning the opening kickoff 70 yards to the MSU 30 yard line. 4 plays later, WMU missed a field goal. The Broncos next drive was an interception and 2 plays later it was 7-0 Sparty. The Broncos returned the kickoff 100 yards for a TD and a tie score at 7-7. It appears as if MSU has some kickoff coverage issues to work out. MSU would score on the ensuing drive and fail at a 2 point conversion. 13-7 MSU. The 1Q would end 20-7 MSU. The 2Q was more of the same as MSU would take a 27-10 halftime lead. It appeared as if the 2H would prove uneventful. All credit to the Broncos. WMU showed some fight and played the 3Q to a 7-7 draw and we entered the 4Q at 34-17. There was one curious WMU coaching decision that I felt required some explanation. WMU scored a TD with 1:37 left in the 3Q, to make the score 34-16. To me, you clearly go for 2 to try to make it 34-18 and a two score game. But WMU would kick to make it a 17 point game. Not quite sure I get that decision, but it really did not matter. In the 4Q, WMU would get to within 10 at 34-24, which could have been 34-26 if they made both 2 point conversions. A stretch, but that would have made it a one score game and the collar may have tightened on Sparty. But with 7:42 remaining, MSU went up 37-24, which is where the game would end. A valiant effort by the Broncos but they eventually succumbed to a vastly superior team. I believe they exposed some holes that the Spartans will need to work on, if they are to end the year in Columbus playing for the Big Ten championship as everyone expects, and with us there in person watching! To the full credit of the Bronco fan base, no one left this game. The stands were packed from beginning to end and that included the halftime show. Now maybe they were wedged in so tight they could not move, let alone get up to leave or go to the bathroom, but the fact remains the stands were packed throughout. How did this game happen? I think this would be a good time to give credit to some people for making this CFQ trip happen. When we looked at the schedule, we saw an opportunity to go to Boise State, Utah and some other western teams in a double header weekend. But when we looked closer, we saw a CMU and WMU possibility and that they were playing some very good power 5 conference opponents. This was too good to pass up, so this is what we planned. Curiosity got the better of me and I had to find out how these MAC schools got the power 5 conference teams to travel to them. This game was the result of an initiative by MSU AD Mark Hollis to keep football generated revenue within the state of Michigan. I would guess there was some politically motivated actions behind the scenes with some strings being pulled, but the end result was MSU agreeing to a 3 for 1 deal with Central Michigan, Western Michigan, and Eastern Michigan. The Spartans agreed to play one game in Mount Pleasant, Kalamazoo, and Ypsilanti, in exchange for each school visiting East Lansing for three games. WMU went to MSU in 2013 and will return in 2017 and 2019. This was the one visit for MSU to WMU. However it happened, it worked for us at CFQ. The consecutive early wake ups caught up with us, so I am afraid there were no post game festivities. It was back to the Stuart Avenue Inn for some sleep. It was not a lot of sleep as we had an early wake up call again, to make the drive to Grand Rapids for our flights back to NY and Target had a drive to who knows where for a flight to who knows where. So we did not even get to enjoy the breakfast part of bed and breakfast as we departed at around 5 am. Al has a hat from Kalamazoo College. Why, he doesn’t know. You can get a job hoisting the FG net by applying online. Hey, it’s a free ticket to each home game from field level. There were no missing or forgotten items in the packing for this trip, a first. Due to some unfortunate family circumstances, I had to fly to Florida instead of returning to Islip. A very special and heartfelt thank you goes out to the Southwest representatives at the Grand Rapids airport that facilitated my rebooking to get me to Florida and then back to New York. I very much appreciate what you did. And since I had limited clothes with me in Florida, I wore a Central Michigan shirt on the flight back and got a Fire Up Chips chant from the Southwest flight attendant going from West Palm Beach to Islip. Who would have figured that! I actually craved the drink that I got at Starbucks. Leave it to the Starbucks at 49th & Madison to mess up my order and cure me of any desire to ever buy anything at Starbucks again. We are not in Chipotle boycott territory, but I am done with Starbucks. Not to worry Starbucks, this will not change Al’s addiction and he is still good for 2 a day. The Broncos finished the season at 7-5 winning their final game over a ranked Toledo squad. This was good enough for a Popeyes Bahamas Bowl Game where they beat Middle Tennessee 45-31.I don’t know about you, but even if I finished 11-1, I would want to go to the Bahamas Bowl. The Spartans finished the regular season at 11-1, the only loss being a 39-38 loss at Nebraska on an absolutely dreadful officiating mistake that allowed a Nebraska game winning TD to stand. An undefeated Sparty (in my mind) then beat Iowa in the BigTen championship game earning a spot in the College Football Playoff where they lost 38-0 to the eventual Champion, Alabama. Sparty did it with smoke and mirrors because in our two times seeing them live (and other times on tv), this did not look like a championship team. But the trophy looks the same in the trophy case. I am serious You guys need to visit Kalamazoo, again. Brisket Fest is followed up with Otto’s Chicken Fest at Homecoming, and then the is Southwest Fest, which is a University Tailgate with lots of tailgates and bars sponsored by local businesses. And, we now have as many Lyft drivers as Uber since we had the infamous Uber murderer in 2016. Plus our city has a boatload of breweries. We will start taking up a collection, and possibly find a room at the Radisson which hosts the WMU Team, and in the center of downtown. It is tough to pass up anything called brisket fest. I hope homecoming is in September.